Koskela believes that great design can be used to effect social change. When Sasha Titchkosky and Russel Koskela left corporate careers to create Koskela they wanted to create a company that represented their values and had a purpose bigger than the mere pursuit of profits. Koskela has a firm belief that Australia’s unique Indigenous culture is one that needs to be celebrated and acknowledged. The way we have chosen to do this is to create opportunities for Indigenous artists and artisans to collaborate with us, using their skills to create new contemporary design products. This allows the artists to continue to live a life they have chosen to lead, maintaining their traditional practices by creating an alternate income source, independent of any Government funding. We have been doing this since 2009 when we created Yuta Badayala with the artists from Elcho Island Arts. We now have collaborations with the Tjanpi weavers, Milingimbi Arts, Warlukurlangku Artists, Durrmu Arts and the artists of Yarrenyty Arltere - all Aboriginal and Torres-Strait Islander owned and managed Art Centres. As a registered member of the Indigenous Art Code, Koskela is committed to preserving and promoting ethical trade in Indigenous art. The communities we work with are paid in excess for what they normally receive for their artworks and woven goods. To further the development of these opportunities, from 2017 onwards Koskela has committed an additional 1% of all other Koskela product sales to go towards developing more of these projects with Australian Indigenous communities. This 1% is derived from the sale of other Koskela items such as our sofas, tables, and furniture, plus our work on corporate projects, equating to roughly 10% of profits. Conduct business according to the Indigenous Art Code. Koskela is a registered member of the Indigenous Art Code. The Indigenous Art Code is a system to preserve and promote ethical trading in Indigenous art. The Code supports the rights of Indigenous Artists to negotiate fair terms for their work and gives buyers greater certainty about an artwork’s origin. “I thought it would be interesting to take our traditional Yolngu materials and use them on “Balanda” objects. We all thought this would be a good way to show a new audience what can be done by Yolngu artists with materials from the bush. 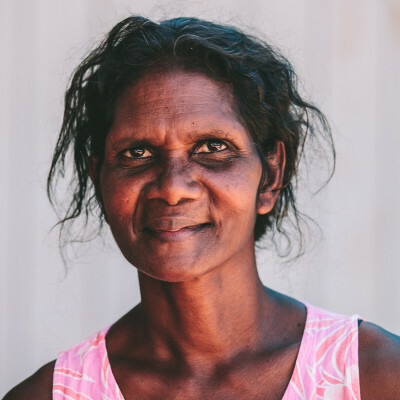 — Mavis Warrngilna Ganambarr, a senior weaver from Elcho Island, on the Yuta Badayala project. “Yuta Badayala is one of the most personally rewarding projects we have undertaken. We feel extremely privileged to have been given an insight into the Yolngu culture and to have developed relationships with the wonderful weavers at Elcho Island Arts. The lights are so special as they are the embodiment of this culture and spirit and are filled with the stories and laughter of their makers. — Sasha Titchkosky, Director, Koskela. Yuta Badayala is a collaboration between traditional Yolngu weavers from Elcho Island Arts in Arnhem Land and Koskela. Tili Wiru is a range of lighting which is filled with the colour and exhilaration found in Tjanpi‘s traditional works. Koskela collaborated with the Yarrenyty Arltere Artists, resulting in a limited edition release of sixteen exclusive cushions. In 2016 Koskela commissioned a series of vibrant hand-painted Christmas decorations by artists of Warlukurlangu, Yuendumu. Our aim was to create something Australian made that was not just beautiful but would also become part of your Christmas tradition. We have loved collaborating with renowned indigenous artist Regina Wilson to create an exclusive fabric range. The fabric designs are based on Regina Wilson‘s intricate linear paintings depicting her weaving. Koskela has proudly collaborated with Rosie Nangala Flemming from the Warlukurlangu Art Centre in Yuendemu to create two very special pieces of stationery, a limited edition gift wrap and seeded gift tag.